It is one of the very few things I do FOR ME. There really is nothing better to me than escaping into a good book. I've always been that way- for as long as I can remember I have loved the feeling of disappearing into the pages of another world. It is such a wonderful way to escape. I admit that part of what I loved was the feeling of the actual books. I loved the feeling of a new book... there was just something about BOOKS to me... I don't know. I'm a total nerd. I love books. I'm like Hermione from Harry Potter. Books are like friends. You can tell I feel that way by the sheer number of them in my home... they are just... everywhere. So I was somewhat reluctant to try e-readers when they came along. Don't get me wrong- I love my computer. I love my iPad. I love my gadgets. But they aren't books. I tried an app for my computer for online reading and pretty much hated it. I tried an app for my iPad for reading on that and found it ... meh. It made my eyes go all wonky after awhile. And it just wasn't as good as a real book no matter what anyone said. But when I was given the chance to review the Kobo Glo I figured I would give it a try. After all it DID look very pretty and very gadgety. And I do love my gadgets. And I have to tell you... I am totally in love with my Kobo Glo! - The Kobo Glo provides a comfortable front-lit eReading display that lets people read any time—day or night. - With Kobo Glo’s E Ink anti-glare screen, it’s just like reading print on paper—even in direct sunlight; it’s also the only high resolution display available on the market. - The Kobo Glo is highly customizable with 24 font styles and 7 font sizes. 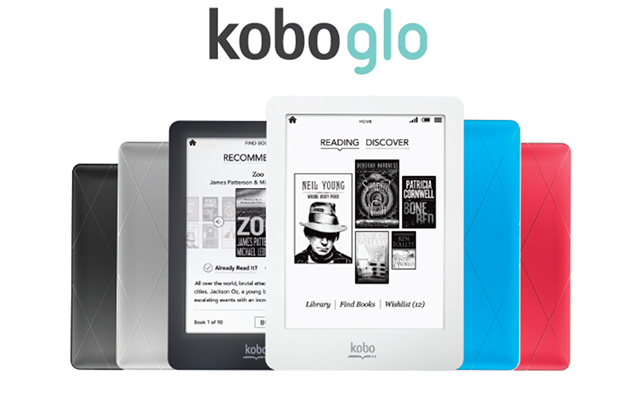 - The Kobo Glo comes in four stylish colour options – Black Night, Pink Sunset, Blue Moon and Silver Star. 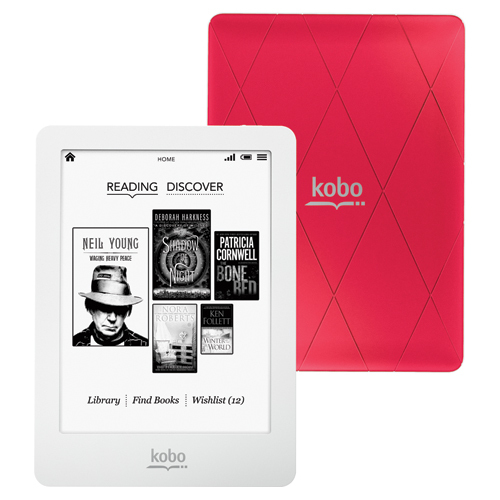 - Readers have direct access to the Kobo eBookstore from the Kobo Glo with a Wi-Fi connection—with a storage capacity for over 1,000 eBooks, with expandable storage with and SD card for up to 30,000. - It has been awarded the PTPA seal of approval. The Parent Tested Parent Approved™ (PTPA) community gave the new Kobo ARC a near perfect score, awarding the device 196 out of a possible 200 points and praising it for its colour display, speed, and ease-of-use for even the youngest of family members. Beyond all of that there are a few REALLY great advantages for a book-a-holic such as myself... the big one being you can carry TONS of books all at once and it takes up NO space. It is lightweight (really really lightweight) and fits in my purse or laptop case. I can fit an entire bookshelf of books in my Kobo Glo. Now when I travel I don't have to choose which book to take with me! It also solves my book hoarding problem. Book hoarding is no longer an issue since the books take up no space in my home. Problem solved. Reading on the Kobo Glo is easy. I do sometimes miss the feeling of actually turning pages and holding a real book... but the advantages outweigh that for me. Plus it is pretty. Mine is pink. I love pink. The only thing I really don't like about the Kobo Glo has nothing to do with the device itself... it is the Kobo store. Actually - the store is ok. There are a lot of books you can buy and they are reasonably priced for the most part. But their selection of free books... um... not great. They claim to have over one million to choose from but FINDING a book you want? Is incredibly difficult. They have made it nearly impossible to just browse through the free books. I hate that. You have to actually search for a book you want. I don't WANT to search for a book I want because I don't KNOW what book I want yet! Hello- book hoarder here. I want to just look at all the pretty books and find one that suits my fancy and say "hello pretty book, come home with me". I have tried searching for various key words but have found it really ineffective. I have tried searching for genres and found that even worse. Honestly it has been nothing but frustrating for me. Worse? If you want to find a free book on the go from your actual Kobo Glo there is only a specific selection available. You can't even access all of them. You have to be on your computer to do that. I am willing to admit that I might just be a complete moron who is totally not getting what I am supposed to be doing... but that in and of itself is a problem in my opinion since I am usually fairly able to find my way around a website. That being said I am still loving my Kobo Glo. I am definitely an e-reader convert!